Our friends at Reaper Miniatures have released the Heavy Gear Blitz Master Series Paint Set as a great one-stop set of paints for all Heavy Gear miniatures. This set includes 36 Master Series paints, 32 of which are never-before-seen colors created especially for Dream Pod 9. This set includes paint colors for all of the Heavy Gear Blitz factions and we will provide painting suggestions using these color names in the future. The Paint Set is $119.99 USD from the Reaper Online Store and is available now. Orders from Reaper's online to the United States and Canada include free shipping. Read more about how to win a Heavy Gear Blitz Master Paint Set at the end of this article. The Heavy Gear Blitz Master Series Paint Set is shipped in a plastic storage case that also has storage space for brushes and other hobby tools. The paints are packaged in dropper-style bottles that are easy to use and prevent paints from drying out to minimize waste. The dropper bottles also allows mixing paints by measuring drops for reproducible custom paint mixes. The back of the case shows all of the included colors. The included colors are packaged the same as the standard Reaper paints, so if you want additional colors not available in this set, you can swap them out the included bottles for Reaper paints or those from other manufacturers that use dropper-style bottles. The included paint colors are shown at right. Eight colors are Reaper's High Density paints that are formulated to better cover other colors completely. For example, Hazard Yellow is an HD paint designed so it can be used over other colors with more solid coverage with less coats of paint required. The Southern Fire Dragon Strider, shown at right, is painted using the new paint set colors. The carapace is République Red on the upper armor panels with the three included greys and the Black Wash to detail the body. The metallics and other colors were used to add details on the guns and other small details. We did add the illuminated sensor lights in Photoshop. 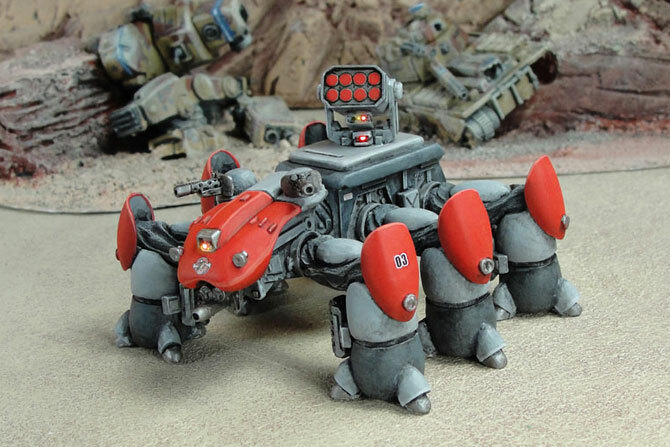 The Heavy Gear Blitz Master Series Paint Set is available now from Reaper Miniatures or the Dream Pod 9 Online Store.